sewing the seeds of love: More Unbirthday swap fun!! Hot on the tail of Miya receiving her swap package from me..I received my package from Miya !! What a fabulous box of goodies ! 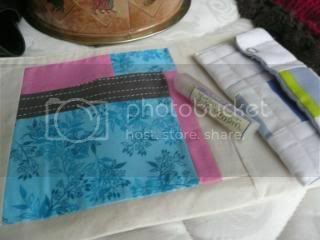 A lovely handmade by Miya clutch purse and mini purse..( favourite colours pink and blues) with some yummy lip balm . 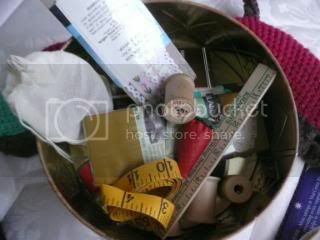 A vintage tin full of vintage sewing notions ...including wooden cotton reels...I LOVE old wooden cotton reels !! oh, and see that little vintage wooden ruler in there, it is from a shop , Kramers' , in Cincinnati, where Miya lives...how cute !!! 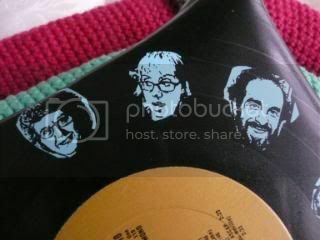 one of the faces is Miya screen printed on it ...see her in the middle here ?? I had to hide it from my son after he wanted to claim it for himself...told me it was too cool for me and that he should have it ...hummph...I think not !! Worst birthday in my very vague memory was my 11th Birthday. Sitting on the side of Mum and Dad’s bed...Mum passes my present, a paper grocery bag ..( Mum being a trendy eco-reylce person way back then)...which contained one after the other of crochet covered coat hangers !!! What the ? !! 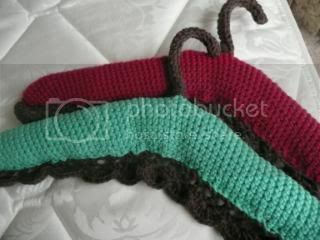 I started to get upset, cried and ran off ( I mean after the seventh ugly nylon crocheted coat hanger, wouldn’t you ?? ). 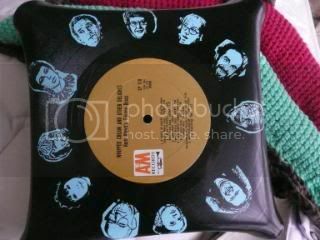 They convinced me to dig past the last 3 coat hangers..at the bottom of the bag was a box containing a watch ( some groovy brand that I can’t remember ) and a compilation music tape that had all the chart hits at the time.....Barry Manilow- Copacabana, 5- 7-0-5 , by an artist I can not remember, and Baby it’s You..by Peaches. I quite liked the pressies ( not the coathangers ) and still have nightmares of giant crochet covered coat hangers taunting me !! LOVE it all Miya...thankyou..yes....even the coathangers !!!!! Enjoyed reading your blog today. I am still finding my way around blogland....I always love making new friends..I am posting about Disney so hope you will stop by. Commenting automatically puts you in the drawing for the June giveaway. Garden swap,river walk and pink tulip! !